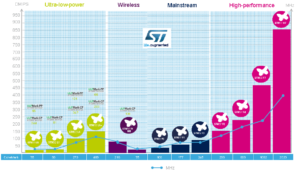 The STM32 family of 32‑bit Flash microcontrollers based on the ARM® Cortex®‑M processor is designed to offer new degrees of freedom to MCU users. It offers a 32‑bit product range that combines very high performance, real-time capabilities, digital signal processing, and low‑power, low‑voltage operation, while maintaining full integration and ease of development. The unparalleled and large range of STM32 devices, based on an industry-standard core and accompanied by a vast choice of tools and software, makes this family of products the ideal choice, both for small projects and for entire platform decisions. The mcus, in magenta color, has an internal cache, this means ZERO wait state to access to the internal Flash. See this video for a general introduction regarding STM32 family.